I'm by no means an expert on China, but it seems to me to be a kind of hobby here to look at a person and guess their ethnic heritage. With Cholita, we had some people who assigned a minority to her, but most said, "She is 'Han', original Chinese." Of course we'll never know, but I've always tended to agree with the Han theory because to me she looks so classically Chinese. Walking through the streets of Kunming, I see so much variety in appearance. In the United States, Americans feel like all Chinese people look alike, but having been to China, I know that's very far from the truth. The Yunnan province is known for its ethnic diversity and you can absolutely see that in the faces and builds of the people here in Kunming. We've spent lots of time in the beautiful Green Lake Park and love people-watching. There is a very wide range of skin tones, body builds, hair texture, and even hair color---who would have guessed that black could have so many different shades? While there was some debate in China about Cholita's ethnic origins, there seems to be no debate about XiXi. I've heard more than one passerby point to him and say, "Yi". Our guide, Helen, said that he is clearly from the Yi group. She said that she knew this for three reasons: First, he was found in an area highly populated by the Yi people. Second, his skin is dark like the Yi, and third (and my personal favorite), she said, "All Yi men are known for their great physical strength. Always very very strong." Since hearing this, when Lyle and I make observations of XiXi, we tend to end it with a deep-voiced, "I am a Yi man." For example, he was such a little tough guy on the rides this morning in Green Lake Park. Although I didn't get it on film, he sometimes did the "look, Ma, no hands" bit. While that might scare other children, certainly not XiXi, because, "I am a Yi Man." We went today and toured a huge theme-park type place that highlighted the different minorities of the Yunnan Province. We learned that the "totem" of the Yi people is the tiger. What's funny is that XiXi has mentioned "lao hu's" more than once and likes to give us a hearty roar. He was fascinated by this "Da lao hu" and pretended that he was being eaten when he walked inside. When he sees a picture of a lao hu, he sticks his finger on its mouth, pulls it away and says, "Owwww!" 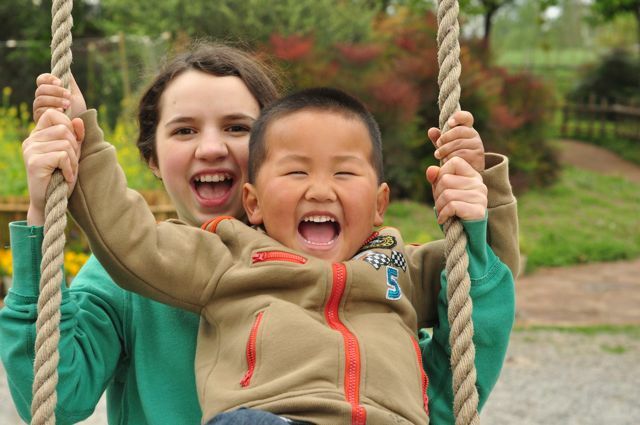 Also in the Yi village, there were swings that were so tall that you could get to seriously terrifying heights. 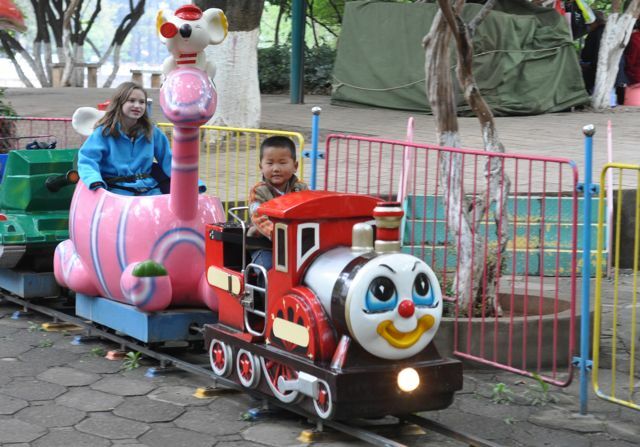 Despite his Yi man bravado, he only wanted to go on it with Da Jie Jie. After we left the minority villages, I looked back at our post from yesterday. The orphanage visit was emotionally draining and I didn't adequately give thanks for the great blessing it was to so palpably feel the love that the workers there had for our XiXi. When we adopted Cholita, although she was in over-all good health, she had some behaviors that clearly suggested neglect. When we toured her orphanage, it was clear that while she was there she'd had very little human contact. I haven't sensed for a moment that our XiXi has been neglected. 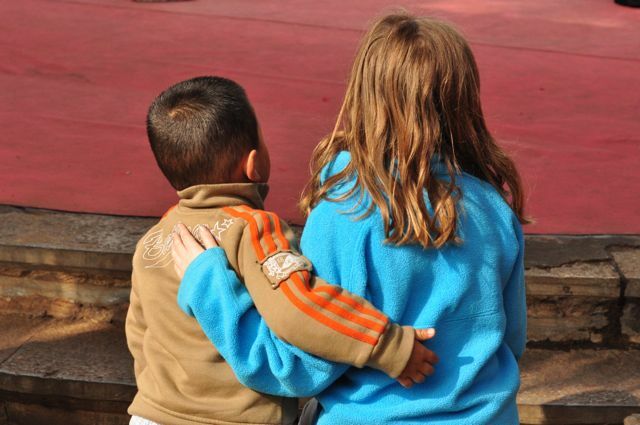 On the contrary, walking through the orphanage with him, I felt like I was with a rock star. Nannies were literally hanging out of windows, waving and calling his name. They were blowing him kisses and despite his Yi Manliness, he blew kisses back. When he first got off of the bus yesterday, he literally ran into a teacher's arms (I mistakenly called her a nanny, but have since learned that the women in the flowered smocks were teachers, while the ones in the light pink smocks were "workers", or nannies). I can't adequately describe my mix of feelings at that moment of reunion between XiXi and a beloved teacher--relief that he wasn't scared or traumatized by being back at the orphanage, envy at hearing the long conversation they were having, guilt that we were taking him away from that, fear that he wouldn't want to leave with us, sadness for these dear women who so obviously adored him and would miss him, and a very healthy dose of joy, knowing that he'd been so loved. And of course, even Yi men need love. "He is curious of the unseen thing." They actually mentioned the word curious more than once. It is so very true. This is a blessing and can also be a challenge. He loves electronic devices--computers, remote controls, I-Pods, cameras, etc. He wants to touch and explore. At the Yunnan Embroidery and Antique Museum, I got a serious workout. The language barrier is a challenge and more than once I asked our guide to tell him, "Please don't touch." He tried very hard to obey, and would remember for a while, but then curiosity would get the better of him and once again he'd want to explore. When he turned a 200 year-old opium pipe into a rifle, I knew it was time to move on. Our travel companions, parents of the charming and beautiful Elita, said that their 4 year-old son at home would have been equally challenged, so I know that most boys of this age would not be impressed with embroidery and antiques. The funny thing is, after reading his referral paperwork, the song that kept coming to my head during our wait when I'd think of XiXi was that song from the Curious George movie, "Upside Down." It's a perfect theme song for our Yi man and one I will use when I create his adoption video. "He is fond of the food he never eats." Holy cow, does this boy love to chur. Anyone looking at him would assume he can put away the food and they'd be right. On Gotcha' Day, I noticed a bulge in each of his coat pockets. I unzipped the pockets and discovered two packets of pills with directions written on the bags in Mandarin. I had our guide tell us what it said and she told us that they were digestion pills to give him 3 times a day, "because sometimes he eats more than he should." We haven't been giving him the pills (our guide is not happy with us) because 1) I have no idea what's in them, 2) I doubt we could get that particular brand of ancient Chinese secret in the U.S. anyway, and 3) we'll just make sure that he doesn't eat more than he should. So far, we've been O.K. I do have to disagree with the nannies though about him being fond of the food he never eats. Lyle gave him some shredded cabbage the other day and after trying a bite, he promptly tilted his plate over the side of the table and scraped it onto the floor with his chopsticks. We felt rather shocked at this behavior and told him to not do that. He gave us a look of complete innoncence, shrugged, and said, "Boo how chur." Bad food. Simple as that. We have since learned that it's totally acceptable in the foster village, where they often eat outside, to dump your food on the floor. It doesn't really fly in the U.S. though. Thankfully, he's only done it once. Maybe it's just that cabbage is the only chur that he finds boo how. Entirely possible. This phrase, repeated more than once in his paperwork, worried me. Of course, everyone wants children that are active, but I wondered exactly how active. Was he active like, get this kid into sports because he'll be great? Or was he active like, get this kid on ritalin now because that is the only way you'll survive? I'm thankful to say that he's just a normal, healthy little boy type of active. He certainly has his moments of being a little too active, but for the most part, he's extremely well-behaved. And under the present circumstances, I can't believe how well-behaved he really is. The other day, when he was a little too wound up, one of the kids told him to calm down and he started doing this zen-like meditation thing with deep breathing and funny arm movements. The kids all laughed and said that they taught him that. He is such a mimic and such a complete and total ham. Absolutely, without a doubt, true. I have to keep reminding myself that he's only 3 because not only does he physically look older than that, mentally he seems older too. It's strange even to me that I'd make that assesment when we can hardly communicate verbally, but you can just see that he does not miss a thing. I also know that I'm getting only a fraction of what he can do and what he knows. I've heard him count up to 15 in Mandarin and get the impression that he could keep going. He knows many songs and loves it when we all sing with him the "Two Tigers" song, a traditional Madarin children's song that we learned before we left. 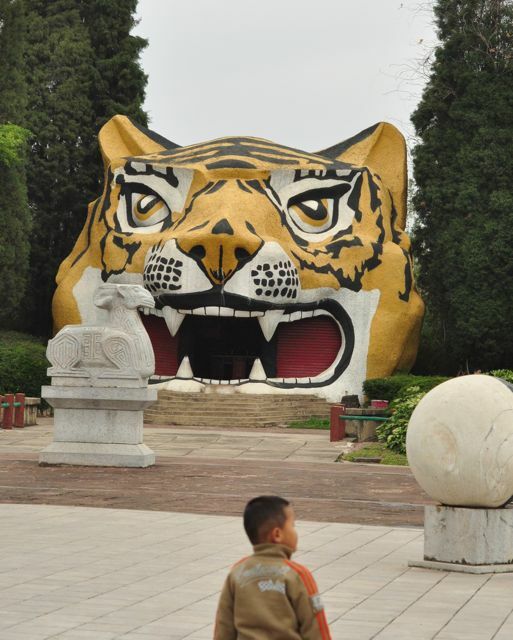 And of course, being a Yi man, with the tiger totem, how could he not like the lao hu song? He speaks so clearly and although he chatters at us in Mandarin, it's obvious that he knows we don't understand. What a sad thing for this little boy. If he really wants to say something, he knows he has to come to mom for his best hope of being understood. Sometimes I can get the gist of it, but oftentimes not. The few phrases that everyone knows, he uses often and says them with a big smile. I don't know if we're making more progress teaching him English or if he's making more progress teaching us Mandarin. I was reading him a baby board book the other day that had a single picture on each page, showing parts of the body. I'd say foot, he'd shake his head and say, "zu". That went on through the whole book with me saying the English word and him correcting me in Mandarin. At one point, he turned and looked at me and gave me this deeply concerned look that seemd to say, "Really, woman. This is like basic." The kids are learning some of his phrases too and will tell us bizarre English/Mandarin things like, "XiXi wants to chur." or "XiXi yows (wants) something." When the kids were wanting to buy some souveniers yesterday and Rose was holding up a little doll she wanted to buy, XiXi said to the woman at the stall, "Dwo shaow chen?" (How much is it?) XiXi is also learning some English. His first English phrase (I'm embarassed to say) was "Come on." We've been on the go, O.K.? He will learn English quickly, I have no doubt. I can't imagine that any Yi man worth his salt would appreciate being called lovely, but as his Mama, I think it's true. Honestly, when I first saw him on Gotcha' Day, he was so much older-looking and so much bigger than I'd envisioned, that I had a hard time aligning the "real" XiXi with the pictures that I'd studied for months. It made me a little sad because I so dearly loved those pictures. Now, of course I still love those younger pictures, but I also love my big lug of a boy. He is lovely, don't you think? "He cares everyone and everything around him." This had to be my very favorite sentence in all of his paperwork and the one that I hoped most sincerely was true. I'm happy to say that despite the Yi man exterior, this boy has the heart of a teddy bear. That's not to say that we haven't had to remind him to be gentle, because we certainly have, but his usual demeanor is total love bug. He initiated this little snuggle fest with Rose while watching a show at the Minority Village. It just melted my heart. He adores his two oldest sisters, much to their delight. He also loves Gu Gu and Xiao Jie Jie, but I think Gu Gu intimidates him a little and with Xiao Jie Jie, he's trying to establish his place. For her part, Cholita has been wonderfully patient with him. The other night at dinner, when XiXi was playing with his knife, I took it away from him. He seemed fine with that, but then looked over at Xiao Jie Jie and quickly took her knife away too and gave it to me. His message was clear: "If I can't have it, Xiao Jie Jie shouldn't have it either." There have been some squabbles, but they've been minor and short-lived. I expected worse, and that certainly may come in the future, but his go-to personality appears to be very loving. I'll admit that I asked him to do this, but the fact that he did says something about our guy. He's Yi man tiger on the outside, kitten on the inside. "He can cross buttons with glass fibers." It's very late/early here, so I'd better try for some sleep. I'm still not on China time. Tomorrow we make the long trip (2 1/2 hours) out to the famous Stone Forest and then we'll go to his finding location. I got a lump in my throat just typing that. The next day Lyle, Bruder, and Cholita will leave for home and I'll travel to Guangzhou with the rest of the crew. Our time in Kunming is quickly coming to an end. We've loved his city and will always be so thankful that they've allowed us to claim one of their precious strong Yi men as our own. Oh wow...it sounds like you are really getting to know him! He is a delightful little (maybe not so little) boy! It's fun getting to know your little guy. I'm confident that you guys will continue to do a wonderful job helping him adjust to his new life. I spoke with a mother at school who adopted a baby girl from China. She said that it was a good sign that XiXi cried on gotcha day. Apparantly having no emotion would be more of a worry. Your Yi Man is positively precious!! He and Daniel can distruct together at the Reunion. When is his birthday? I loved reading about how true his referral information is. It sounds like you guys are having a great time. Take lots of pictures of the Stone Forest for us. I wish we could have gone. He sounds like such an amazing little person. I love your detailed and lengthy description. It just brings him to life for a complete stranger like myself. I am sure you did the right thing about the pills. I too get amazed at how much variation there is in Chinese features when you stop and take the time to look carefully. When people ask me if my two daughters are "really" sisters, I wonder how they could even think that. They look so different. I think my youngest may be a minority too as she is from an area only 50 miles from the Vietnam border. She does have many typical southern Chinese features, but she has the most amazing round eyes, rounder than most caucasians. I am really enjoying your journey. Keep up the blogging. Wow...I feel like I know him from your post. What a sweetheart he sounds like. I love your description of the yi-man...hilarious and he totally fits it! !